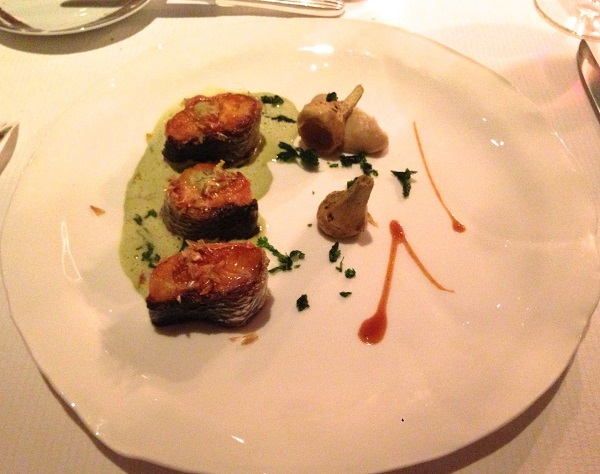 This recent dinner at L’Assiette Champenoise was off the charts. Proprietor Arnaud Lallement is at the top of his game these days. The buzz was everywhere while I was in Champagne. Arnaud Lallement had just received his third Michelin star at L’Assiette Champenoise, the hotel/restaurant he and his family have lovingly restored over the last few years. L’Assiette is located in Tinqueux, an otherwise non-descript suburb just outside of Reims. I have been staying at L’Assiette since 2010, well before the glory days. The restaurant has long been ambitious, but the results were mixed. I never really loved the food. As for the hotel, well, it took a few years for the Lallement family to convert the rooms from dingy into ultra-chic. All of that work has paid off big-time. L’Assiette Champenoise is now well worth a visit, for both the hotel and the restaurant. My most recent dinner was simply off the charts. The food seems to have gotten a bit lighter and more finessed in recent years, both of which appear to have elevated Lallement into another realm. The Langoustine Royale is off the charts. 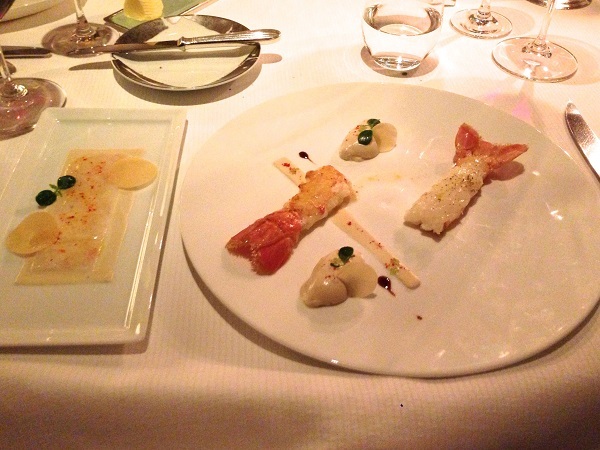 Three succulent langoustines, each prepared differently, adorn the plate. The flavors are intense yet delicate in this fabulous first course. 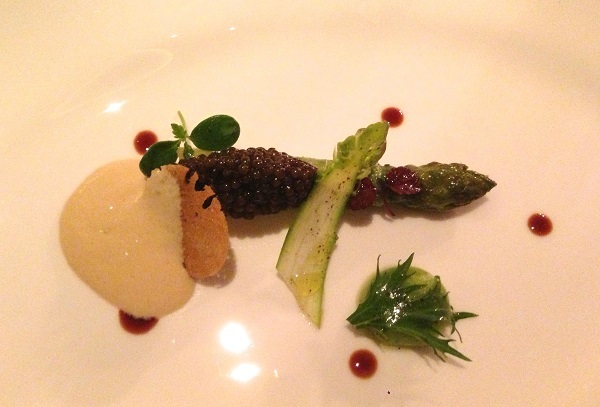 A perfectly cooked asparagus spear with caviar is simply divine. The line caught bass, which is seared and rich in texture, is a surprisingly well suited to red wine. L’Assiette’s coffee and tea selection is vast, while the numerous mignardises are more than enough to satisfy sweet cravings. Our wines are equally terrific. Henri Giraud’s NV Code Noir Rosé is rich, vinous and beautifully textured in the glass, but it also retains surprising minerality and tension. Sadly, the Code Noir Rosé has been discontinued in favor of the new NV Fût de Chêne Rosé, which includes Chardonnay, as the Code Noir Rosé, which is 100% Pinot, wasn’t always developing well in bottle. I saw evidence of that with the first bottle we ordered, but the second was sublime. If there is one region I wish I could taste more often it is the Northern Rhône. I adore the Chave wines, and in particular the Ermitage Cuvée Cathelin, although, sadly, I don’t get to drink it as often as I would like. 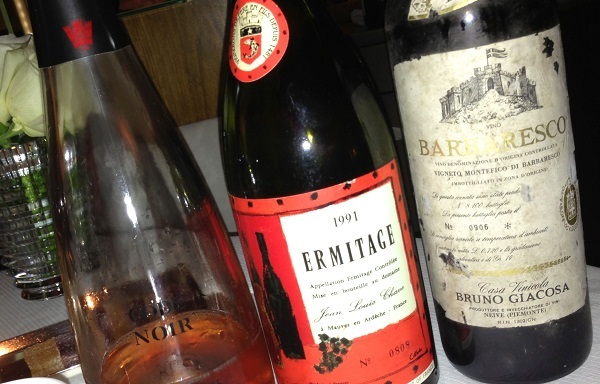 Constantly changing in the glass, the 1991 is simply off the charts. There is a purity of fruit that is simply dazzling, while savory and charred notes add layers of complexity over time. Simply put, the 1991 is thrilling. What a wine. Bruno Giacosa’s 1971 Barbaresco Montefico remains an early masterpiece. Menthol, dark stone fruits, wild flowers and leather are some of the many notes that captivate the senses in this uber-classic Barbaresco from the genius of Neive. Ideally, the Montefico would have gotten a little more air, as the wine really needed quite a bit of time to open up. When it did, it was gorgeous. If you are planning a visit to Champagne do yourself a favor and spend a few days at L’Assiette Champenoise. The hotel and restaurant are pricey, but well worth a splurge. The remodeled hotel is gorgeous and the food has never been better. Krug, Roederer, Taittinger and a host of other houses, both small and large, are only 15 minutes or so away. What could be better?